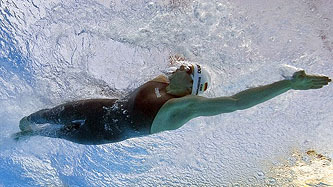 High-tech swimming suits […] are primarily about distribution not efficiency. A small increase in speed over one’s rivals has a large effect on who wins the race but no effect on whether the race is won and only a small effect on how quickly the race is won. We get too much investment in innovations with big influences on distribution and small (or even negative) improvements in efficiency and not enough investment in innovations that improve efficiency without much influencing distribution. There is good reason to be skeptical about regulation in general but since this product, “financial innovation,” is primarily about distribution I’m less worried about regulation in finance than in fields where innovation is more closely tied to efficiency. High frequency trading is a good example of this. Taken by itself, it’s probably not that big a deal. In the great scheme of things, the amount of money involved is small and the price paid by ordinary traders is microscopic. Still, it’s a pretty good symbol of what’s wrong with the modern finance industry. Even the CEO of a cigarette company can come up with something good to say about his product, but supporters of HFT mostly come up blank. They mumble a bit about providing liquidity to the market, but it’s obvious that even they don’t really believe what they’re saying. In the end, HFT has a gem-like clarity to it: it’s an unadulterated example of clever investors figuring out a way to siphon off cash from everyone else by manipulating the system in a way that has no relevance at all to the real world. It’s finance as pure game. Others have made this point repeatedly and in better ways, but the entire purpose of the finance industry is to oil the gears of the business world. Nobody objects (much) to Wall Street bankers earning their paychecks from things that do just that: loaning money, helping companies go public, underwriting bond issues, and just generally allocating capital where it can do the most good. But when those become mere afterthoughts to the real money spinners — CDOs, credit default swaps, option ARMs, HFT, rocket science interest rate plays — all of which are almost completely divorced from providing more efficient services to the outside world, then the outside world starts to wonder what’s going on. As they should. We need a finance industry that’s about half the size it currently is and focused on providing actual financial services to the rest of us. Until we get it, all we’re doing is spending a lot of money on high-tech swimsuits instead of spending money on actually swimming better.